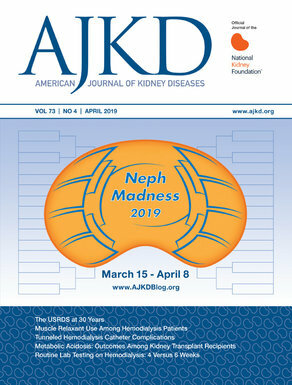 The Goldblatt Reversal: Do Renal Arteries Matter for Hypertension? Although nephrologists have never questioned the primacy of the kidneys in causing and maintaining high blood pressure, the year 2014 was Annus Horribilis with respect to the role of the renal arteries – or at least for interventions targeting the renal arteries. Firstly, all the exciting results from SYMPLICITY HTN-1 and 2 favoring renal denervation were dampened and even negated by the publication of the SYMPLICITY HTN-3, a much more rigorous and robustly designed trial. Secondly, the results of the CORAL trial put perhaps the final nail in the coffin for angioplasty and stenting for atherosclerotic renal artery stenosis (ARAS). Now, in a comprehensive narrative review, Böhlke and Barcellos walk us through the literature surrounding ARAS and measures to prevent and treat it. The link between narrowing of the renal arteries and hypertension was shown in 1934 by Goldblatt who identified the hypertensive effect of even unilateral renal artery clamping. As it became technically possible, revascularization became a widely accepted method of treating ARAS. A surgical approach was followed by percutaneous balloon angioplasty and subsequently stenting. Revascularization became routine not only to treat (and sometimes ‘cure’) hypertension, but also to retard the progression of CKD (for the so-called ‘ischemic nephropathy’). But, as Bohlke and Barcellos describe, first STAR and then ASTRAL exposed the chinks in the armor of the ARAS-revascularization complex. These trials had their weaknesses (ARAS defined as >50%, crossovers, possible exclusion of patients with severe stenosis, high rate of procedural complications, among others), which is the reason that hopes were high that CORAL would vindicate the established practice of revascularization (the public comments at the CMS website when CORAL was underway makes for an interesting read about the underlying biases). Furthermore, though these three trials are the most notable, they are not the only ones (see table 2 from the Bohlke and Barcellos review, and this updated, post-CORAL meta-analysis). The disappointment of CORAL has resulted in a search of flaws in that trial (eg, see this example that argues that the subgroup of > 80% stenosis was analyzed improperly). However, the onus is now on the other side to prove that revascularization makes a difference in patients with more severe stenosis given that revascularization is itself not a benign procedure with a risk of procedural and renal complications. There are several important caveats to these trials. One of the cornerstones of the current management of ARAS is the optimization of medical management. Indeed, with the current spectrum of available antihypertensive medications and the painstaking measures needed for successful control (including proper assessment of non-adherence), truly refractory hypertension is rare. Böhlke and Barcellos also make the point that bilateral renal artery stenosis is not an absolute contraindication for using renin-angiotensin system blockade. In addition, revascularization still has a role in renal artery stenosis due to fibromuscular dysplasia. An argument has also been made that even a revascularization-induced reduction in the number of antihypertensive medications (with their accompanying side effects) is an important patient-oriented outcome, but still an improvement in quality of life has not been shown so far. So what should be done for patients with ARAS? Böhlke and Barcellos present one algorithm arguing for testing in only those with a high pre-test probability and intervening in selected cases (such as resistant hypertension, flash pulmonary edema, declining kidney function), similar to the last iteration of the Canadian guidelines. However, imaging to diagnose ARAS when one may not necessarily intervene is fraught with problems in this era of choosing wisely – apart from the problem of the oculo-stenotic reflex. Others have contrasting opinions. The authors of the updated meta-analysis state a stringent, evidence-based position (intervention only for flash pulmonary edema), while other societies have nearly completely discounted the recent evidence. Will we have more trials to further our understanding, and bring these extreme positions closer? Unfortunately, it seems one of the promising trials in patients with ARAS and heart failure was withdrawn due to a failure in enrolling patients. Another trial should have been completed and will hopefully be published soon, but is unlikely to settle the issue conclusively.